Ted Cruz is still favored to win Texas, but it may not be as easy or resounding of a victory as he would like, many Republican strategists say. Billionaire Donald Trump is seen as Cruz's biggest threat at home. Minutes after Ted Cruz claimed a disappointing third-place finish Saturday night in South Carolina's primary, the U.S. senator was already shifting his attention to Texas, extolling it unprompted to his home-state press corps backstage. "I cannot tell you how excited I am to be back in the great state of Texas in just a few days, to sleep in my own bed, to be with the greatest people on the history of the planet," Cruz said, brushing off a question about whether his showing in the Palmetto State spelled danger for his campaign in other southern states. Yet Texas, long considered a place where Cruz could run up his delegate count on March 1, no longer appears to be entirely comfortable territory for its junior senator. With just over a week until its primary — and many ballots already cast early — Cruz's grip on his home state does not appear ironclad, even with all his rivals with major Texas ties officially out of the race. In interviews Monday with more than a half dozen Texas-based GOP strategists, a consensus emerged: Cruz is still favored to win Texas, but it may not be as easy or resounding a victory as he would like. They uniformly cited billionaire Donald Trump as Cruz's biggest threat at home, especially after a South Carolina primary in which Trump took the gold by a wide margin, giving him another burst of momentum as the nominating contest heads deeper into the South. "I think he is safe here, but I think it just got a lot more competitive for him," said one strategist who, like the others, was granted anonymity to candidly discuss the prospects of one of the most popular Republicans in Texas. "The idea that you can just sit back or just let a couple of state senators wrangle up your vote for you just isn't realistic." "He has to come and work now," the strategist added. Some of the strategists offered anecdotal evidence of a tightening race between Cruz and Trump gleaned from their own polling in certain legislative districts, as well as conversations with activists, donors and voters. Regardless, they noted it was remarkable that Cruz facing serious competition in his home state has even become a topic of conversation. "I don't think anybody associated with Cruz would have thought it had gotten to this point," another strategist said. Public polling on the GOP race in Texas has been sparse and largely inconclusive about the strength of Cruz's home-field advantage. One survey conducted Jan. 25-26 found Cruz up on Trump by five points, 30 percent to 25 percent. Another poll completed just a few days earlier put Cruz's margin at 15 points, 45 to 30 percent. Cruz's campaign insists it is "not just assuming Texans are going to vote for us because they're Texans." Instead, Cruz's aides say he will be pressing the case that he kept his word to them when he was first elected in 2012 in a come-from-behind victory. "We’re very confident in our positioning in Texas, but we’re not taking anything for granted," Cruz spokeswoman Catherine Frazier said, naming Trump and Rubio as competition in the state. "We know that there are other campaigns running aggressive campaigns, and we're going to do everything we can to outperform them." Cruz's campaign has no doubt taken Texas seriously. He has won the support of some of the state's top Republicans, including former Gov. Rick Perry and Lt. Gov. Dan Patrick, both former critics to varying degrees. He has the backing of roughly a quarter of Republicans representing Texas in Congress and nearly half the Republicans in the state legislature — not as easy as some might think given the divided loyalties among Texas-connected candidates at the start of the race. And he has built a ground game here that includes more than 27,000 volunteers, 57 congressional district co-chairs in all 36 districts, and 462 county chairs and co-chairs. 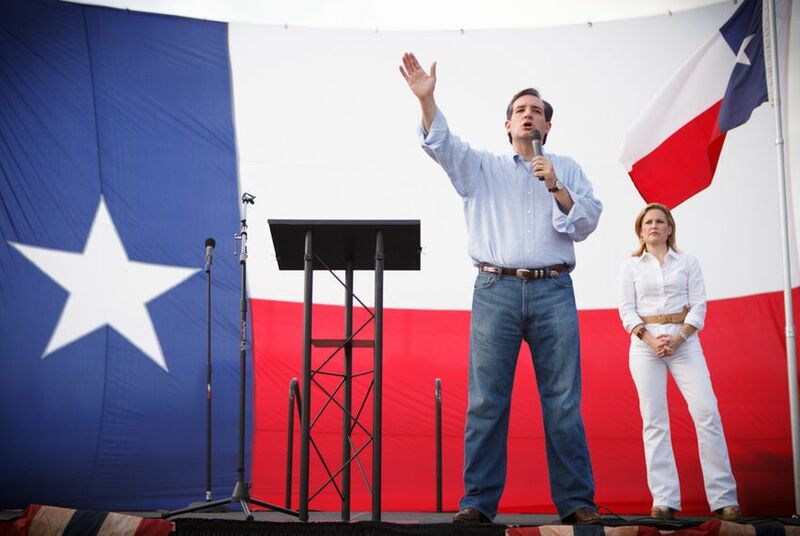 Some of Cruz's most prominent surrogates are expected to fan out across the state in the run-up to the primary, including Patrick, Perry, Cruz's father Rafael and his wife Heidi, who already has eight meet and greets scheduled Friday through Sunday in Texas. Cruz himself plans to be in the state on election night and make a number of Texas appearances surrounding the Republican debate Thursday in Houston. He has already been announced as a speaker at the Harris County GOP's Lincoln-Reagan Dinner on Wednesday in Houston. Arguing he is running a national campaign, Cruz has never ruled any state a must-win. He has stuck with that approach when it comes to his home state, most recently on Sunday — when he was pressed on NBC's "Meet the Press" about whether he could beat Trump in Texas. "Look, we hope to do well," Cruz ultimately said. "I believe we will do well." Cruz's supporters in Texas are confident he will prevail on March 1 but acknowledge Trump's strength cannot be discounted, especially as the billionaire racks up wins. He is expected to claim his third straight victory Tuesday in the Nevada caucuses, the last contest before the group of mostly southern states vote March 1 in what is being called the SEC primary. "I think Texas will go big for Ted Cruz," state Sen. Lois Kolkhorst of Brenham said in an interview Friday. "Certainly, Donald Trump has some momentum now, and he's the media darling in some ways, but I don't see anyone else resonating" in Texas. Very little is known about Trump's campaign in Texas, especially after Corbin Casteel, a Republican consultant known around Austin, stepped down last month as the billionaire's Texas state director. Casteel was replaced by Joshua Jones, a relatively anonymous operative. Neither Jones nor Trump's campaign in New York responded to requests for comment. Reporters in Texas have largely been left to read the tea leaves through a series of emails Jones has sent to Trump supporters, many of them seeking to build state-level coalitions of students, hunters, pastors, first responders and teachers. Multiple emails from Jones have said the race in Texas would be "too close to call" if it were held tomorrow. After Cruz beat Trump in the Iowa caucuses with the help of a widely acclaimed ground game, Jones used the news to try to simultaneously assure and motivate the billionaire's supporters in the Lone Star State. "While Senator Cruz is widely believed to have home state advantage, we believe our organization is capable of pulling off a win — and Iowa in that regard should be a warning," Jones wrote. "While a substantial number of Senator Cruz' Texas supporters volunteered in Iowa, his strong first showing this election cycle was a matter of necessity as his national name recognition isn't as strong as Mr. Trump (who enjoys a high level of popularity in all 50 states)." U.S. Sen. Marco Rubio of Florida is also expected to be a factor in Texas, though few see him competing at the same level as Cruz and Trump. One of the biggest questions surrounding his candidacy in the state is whether he can notch 20 percent of the vote, the threshold at which a candidate can start collecting delegates either statewide or by congressional district. Polling has shown him falling short, though his backers here are hopeful he can cross the threshold by winning over former supporters of ex-Florida Gov. Jeb Bush, who dropped out of the race Saturday. Rubio's campaign has assembled a Texas leadership team co-chaired by five current and former state representatives and filled out by 27 other prominent Republicans from across the state, including a handful of Bush supporters who switched over as the former Florida governor flamed out. From early on, Rubio demonstrated an ability to make inroads with some of Texas' most prominent Republican donors, even with Bush and Cruz reeling in many of the big fish. State Rep. James Frank of Wichita Falls said Rubio's campaign in Texas does not "expect to win but will certainly take it." Instead, Frank sees Rubio accumulating support by capitalizing on the minority of areas that are not Cruz strongholds, perhaps more moderate enclaves. "This is a delegate game at this point," Frank said. "At the end of the day, when you’re going against the Texas senator, you’re going to go against him in places where he isn’t as strong." Between Trump's potential momentum by March 1 and Rubio's corner on some establishment support in Texas, Cruz could find himself more pinched than he would prefer to be, according to the strategists. That's especially true with Cruz staking his campaign on a strong showing throughout all the southern states set to vote March 1, not just Texas. "If Trump wins Nevada on Tuesday, he’ll have increased momentum from the grassroots and the media as the presumed front-runner," said Brian Haley, an Austin-based Republican operative who worked on John McCain and Tim Pawlenty's presidential campaigns. "When you combine this with establishment donors rallying behind Rubio, Super Tuesday is turning into the perfect storm against Cruz."